There had for a long time, in the late 1800s, been conflict between the British Empire and South Africa's Afrikaans-speaking Dutch settlers, known as the Boers ("boer" being the Afrikaans word for farmer). At that time the Boers held two independent republics, the South African Republic (Transvaal) and the Orange Free State - which are both somewhat inland from the Cape Province (which was held by the British Empire). In 1899 the second Anglo-Boer War broke out which resulted in the two republics being incorporated into the British Empire. Due to the title of this post you've probably gathered that there's a relationship between barbed wire and the Anglo-Boer war. 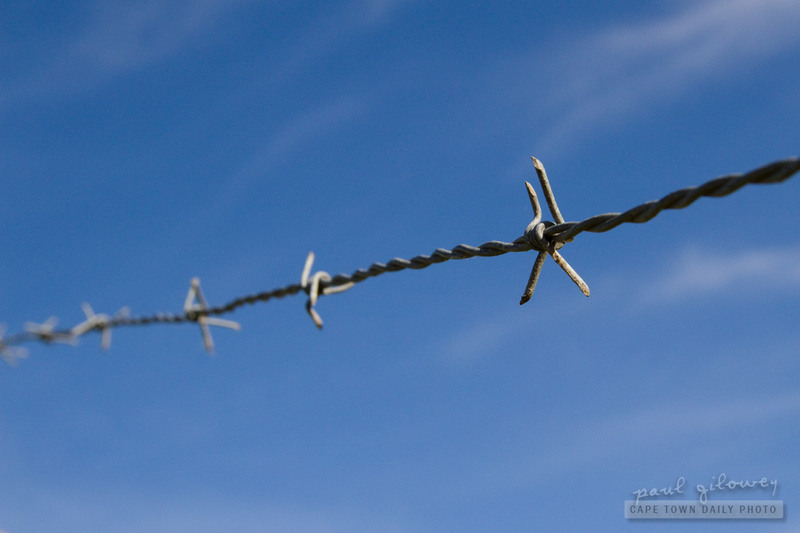 Allow me to explain: Barbed wire was developed in 1860 to keep livestock from wandering into neighbouring properties. It's use spread from France to America and was later used for military purposes in the Spanish-American War during the Siege of Santiago. The British armed forces must have learned from this as only a year after the Seige of Santiago did they use barbed wire to build the infamous concentration camps that kept the Boers wives and children captive. Posted in General and tagged history on Monday, 31 October, 2011 by Paul. True, barbed wire to corral cattle was quickly adapted for military use in the Russian-Japanese War and Spanish-American War, then by the British in the Anglo-Boer War. ‘Same sort of continuum spread “concentration camps” — in the sense of *concentrating* civilian refugee populations. First used by the Spanish in their war in Cuba, then by the Americans in the Philippines War, and the British in the Second Anglo-Boer War. The term took on new meaning when Nazi Propaganda Minister Josef Goebbels adopted “concentration camps” as an innocuous-sounding euphemism for WWII German extermination centres. For reference folks, Sidney’s the author of KRUGER’S GOLD: A novel of the Anglo-Boer War, an Amazon digital book – which you may find to be an interesting read. Contemporary photographs show no signs of barbed wire around the open civilian concentration camps, all too many of which were nothing better than clusters of canvas bell-tents. What few military guards were present were mainly to enforce strict disciplinary rules forbidding British soldiers from entering the camps. The crowded, disease-ridden, insanitary, and hopelessly incompetently-run camps were under civilian administration, not military. The hapless women and kids there were literally refugees, with nowhere else to stay; their isolated farm homes having either been burned by British patrols to destroy havens for Boer commandos, or abandoned by womenfolk whose men had left to fight the British, leaving their wives alone in understandable but usually unfounded fear of assault by blacks. Seldom mentioned now is the fact that the camp inmates included a considerable number of non-Afrikaners, many of whom also died there from diseases, cold, and malnutrition. The camps were a dreadful tragic episode costing 28,000 innocent lives, that — however unintentional — has stained Britain’s honour to this day. It also doesn’t mention the (seperate) black concentration camps (yep, again the English devised this magical idea – along with other forms of segregation which existed well into the following century) where a reported 14000 people (mostly children) also died. Experts believe this figure to be closer to 20000. Interesting.